Cromer Am. Op. & Dram. Soc. C.& S. Am Op. & Dram.Soc. The coming of the railway in 1877 and the buidling of the station above the town of Cromer would lead to the building of a whole new estate, Suffield Park. The road down from the station through the newly developed area would be named Station Road. 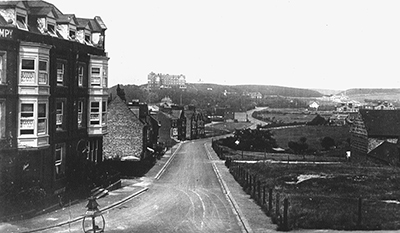 The Station Hotel has alread been built at the time of the photo but few buildings as yet line the road. We've put just a few pictures of the first Cromer staion here and we'll add some more as we track them down. The site is now more or less completely covered by housing and little remains that is identifiable. The initial development of the railway by the East Norfolk Railway Compnay very much involved the Lord Suffield of the period; the papers of Lord Suffield's Gunton estate give information on the coming of the railway. There is much research to be followed through now that the papers have been catalogued at the Norfolk Record Office.